FRIENDS, we are looking for volunteers for our GRAND OPENING on April 26th from 10-2. Please see the list of needs below. Please email me at keperez00@gmail.com if you can help. I have had a number of you ask where you can make a donation toward Phase 3 of the dog park; please send them to Friends of the Hays Dog Park, P.O. Box 1614, Hays, KS 67601. We still have approximately $30,000 to raise for the final phase. Thank you! 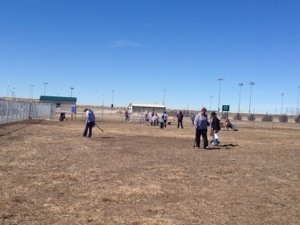 Thank you, thank you, thank you….to all of you who helped with the Dog Park Clean Up Day! We had about 15 people and a full parking lot!! We picked up some poo and trash, filled in some holes, and gaps around the fence. Overall it was a huge success!!! The Dog Park Clean Up Day, originally scheduled for Sunday, March 2nd, has been rescheduled for Sunday, March 9th from 1-2 PM due to weather. On March 9th we will have trash bags. You may want to bring a pooper scooper! Also, please keep Fido at home; it is hard to clean up AND supervise a dog at the same time. See you then! I have attached a great article about the common mistakes that people make when they take their dogs to the dog park. Are you guilty of any of these mistakes? I know I was….but now that I have read the article I am working hard to correct them. Please read and share the article. Let’s make sure the dog park is a fun and safe place for our dogs! The more I read and observe at the dog park, the more I think having small dogs in the big dog area is a bad idea. Dogs are predators. And I have witnessed some big dogs stalking small dogs at the park. I have also witnessed a pack of large dogs chasing a small dog at the park. It may have been fun and games, BUT if just one of those larger dogs perceived the small dog as prey….then there could be trouble. The article I have linked here explains more about the prey drive. Please keep your dog safe at the park!